The Asian hornet is native to South-East Asia and was probably introduced by accident through imported goods from China. Since its first recording in France in 2005, it has spread rapidly into Germany, Italy, Portugal, and Spain. 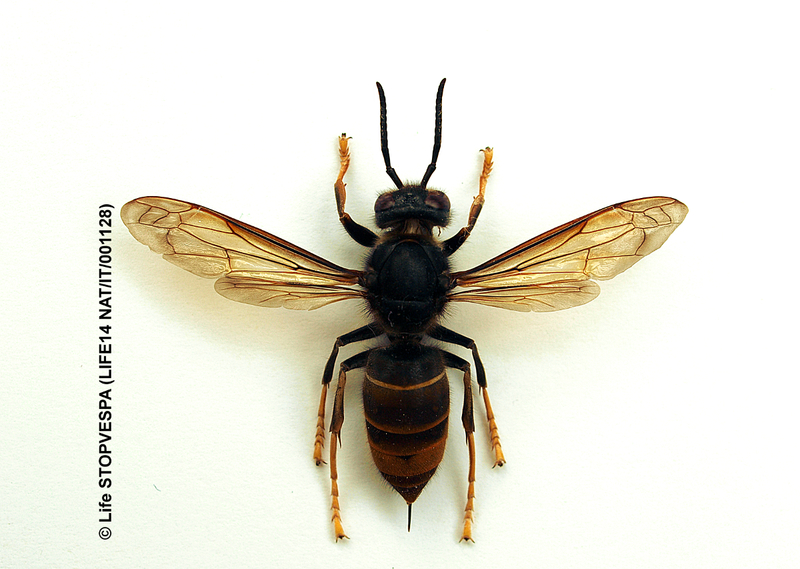 The Asian hornet is a highly effective predator of honey bees, wasps and other important pollinators, such as hoverflies. The huge size of its colonies (consisting of up to 10,000 individuals per season) means that they can rapidly decimate entire beehives. Observations in France noted losses of 14,000 honey bees per hive per month. Due to its aggressive nature and feeding habits, it could have a serious impact on native insect biodiversity and on pollination services in general. 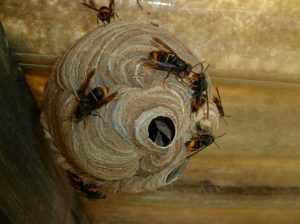 Given that queen hornets are highly mobile and very adaptable, there is a strong risk that the species will be able to spread rapidly across the landscape, causing significant economic and ecological damage. EU-level action seeks to prevent this spread by inter alia rapidly destroying its nests. In addition, where the species has become widely spread, appropriate management measures have to be taken. Appearance and biology information taken from the Bee Base website; The Asian hornet is smaller than our native hornet, with adult workers measuring from 25mm in length and queens measuring 30mm. It's abdomen is mostly black except for it's fourth abdominal segment which is a yellow band located towards the rear. 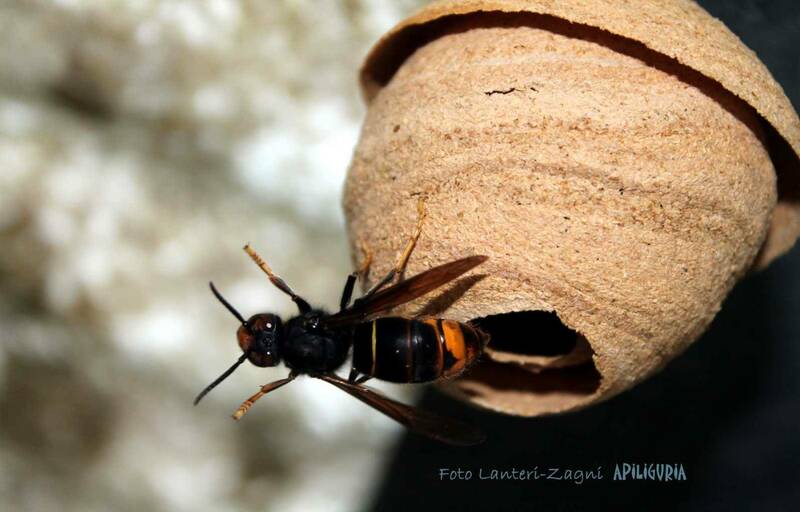 It has characteristically yellow legs which accounts for why it is often called the yellow legged hornet and it's face is orange with two brownish red compound eyes (image 1). After winter hibernation, in spring, the queen, usually measuring up to 3 cm, will emerge and seek out an appropriate sugary food source in order to build up energy to commence building a small embryonic or 'primary' nest (image 2). During construction of the nest, she is alone and vulnerable but she will rapidly begin laying eggs to produce the future workforce. 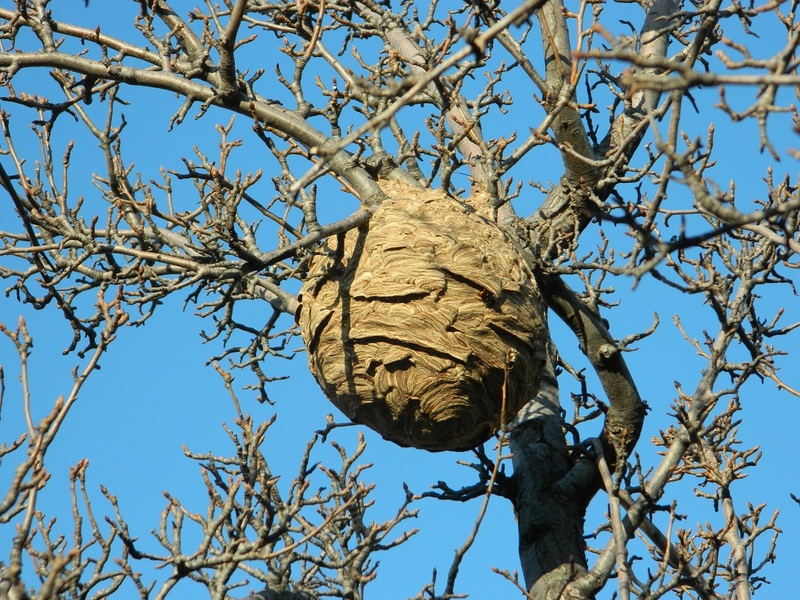 As the colony and nest size increases, a larger nest is either established around the embryonic nest or they relocate and build elsewhere (image 3). During the summer, a single colony, on average, produces 6000 individuals in one season. From July onwards, Asian hornet predation on honeybee colonies will begin and increase until the end of November and hornets can be seen hovering outside a hive entrance, waiting for returning foragers. This is the characteristic “hawking” behaviour. When they catch a returning bee, they will usually sever the head off and take it away and feed off of the protein rich thorax; the brood requires animal proteins which are transformed into flesh pellets and then offered to the larvae. 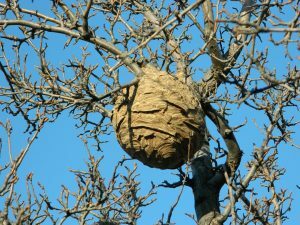 During autumn, the nest’s priorities shift from foraging and nest expansion to producing on average 350 potential gynes (queens) and male hornets for mating, however, of these potential queens, only a small amount will successfully mate and make it through winter. After the mating period, the newly fertilised queens will leave the nest and find somewhere suitable to over-winter, while the old queen will die, leaving the nest to dwindle and die off. The following spring, the founding queen will begin building her new colony and the process begins again. If you are a beekeeper living in Northern Ireland you can register your apiary here - it will assist us to circulate information quickly to beekeepers if you are already registered at the time of an invasion.